It’s currently two and half minutes to doomsday. As your sip your coffee this morning, consider this: the Paris Agreement intended to prevent global warming from reaching its disastrous ‘red line’ is set to fall through, superpowers all across the world at this very moment are gearing up to engage in cyber-offensives, and America’s nuclear codes have been left in charge of the former host of The Apprentice. Are we witnessing humanity’s slow, gradual march towards self-ruin? This is a question one can’t help but ask after watching this week’s latest Doctor Who episode. Spanning just over 45 minutes (honestly, I had to check in disbelief), The Pyramid at the End of the World is one of those rarities in Modern Who that’s capable of delivering a full-fledged story to viewers that feels expansive and deliberate, never rushed. 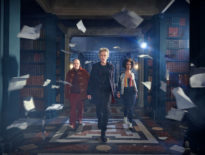 Telling an invasion story, as co-authors, Steven Moffat and Peter Harness have, over the course of three episodes has given them the space and opportunity to present a confrontation more complex in its delivery and resolution than audiences normally get to enjoy. Sure the Monks are ‘bad,’ their motivations are imperialistic; but imperialism, as Pyramid reminds us, can be complicated too. Beyond the rotten faces of the Monks (“we have chosen this form to look like you,” one Monk says chillingly) lies a dark pathology humoured by their own technological dominance: they want their authority to be assented to and loved, using their advantage of foreknowledge to choose the most opportune moments – global catastrophic risks – to stage interventions in the lives of their future subjects. 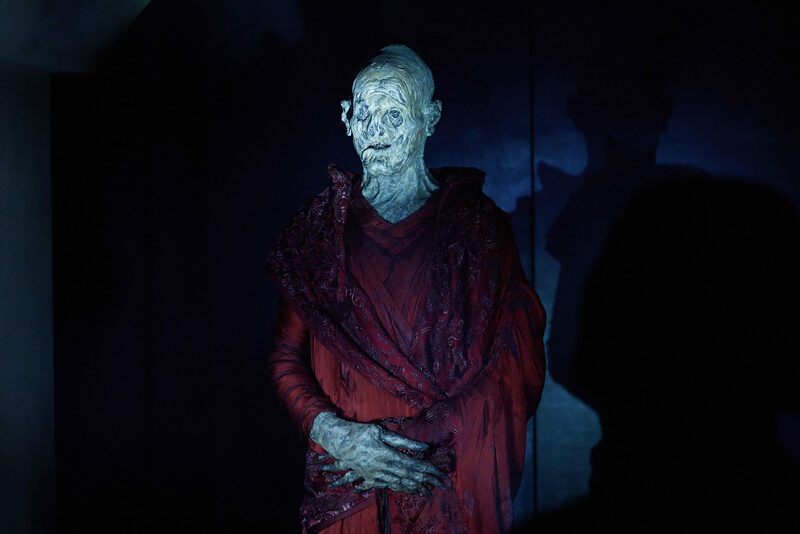 It’s in this sense they’re more despicable than the Doctor’s typical adversaries – such as the Daleks, Cybermen, or the Weeping Angels – the Monks have all of the heightened technology and all of the knowledge of the Time Lords, but share none of their conscience or their sense of responsibility. With this story, the second instalment of the “Monk trilogy,” Harness and Moffat introduce us to the global catastrophic risk facing Earth – a biochemical experiment gone wrong that the Monks hope to exploit – but it’s the piecemeal manner in which these events are set-up which is the story’s greatest strength. As was the case with Series 9’s The Zygon Inversion, the marriage of Peter Harness and Steven Moffat’s writing with Daniel Nettheim’s inspired direction makes Doctor Who feel as contemporary and relevant as it’s ever been with this latest adventure. Current, in the political sense of the word, but also in a production sense. For instance, the playful take on the “Previously…” intro allows Pearl Mackie’s Bill (and by extension, the show itself) to quickly refresh viewers on the mind-warping events of Extremis with irreverence, cheek, and efficiency. 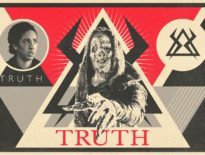 Just as The Zygon Inversion will forever be associated with the contemporaneous, migrant crisis in real life, Pyramid is also a creature of context. 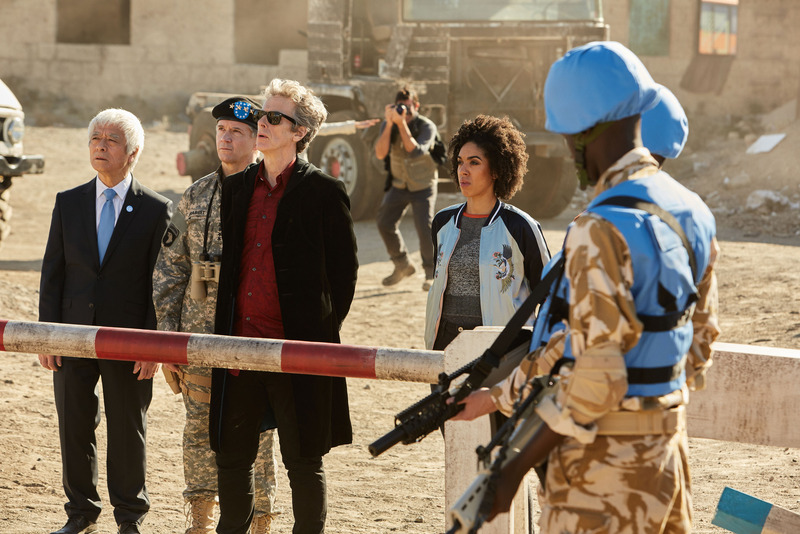 When the Doctor, Bill, and Nardole arrive onsite to Turmezistan, we find the world’s superpowers, China, Russia and the US, in a military standoff. It echoes the increasingly fragile state of affairs that we appear to be living in, as institutions of peace, security, and global governance are weakened (such as the UN, reduced in this episode to ‘observing’ the crisis) and nationalist, ‘Cold War’ sentiments appear on the rise. Indeed, Harness couldn’t have been more prophetic with the timing of the episode’s transmission if he had tried. The same week as Pyramid aired, the real President of the United States refused to endorse the terms of the NATO treaty wholeheartedly and blurted to the Philippines leader that nuclear submarines could be prepositioned off North Korea; North Korea, a fragile (if not failed) state, lies geographically at the intersection of Russia, China, and a US ally, South Korea – just like Turmezistan. The Monk’s exploitative and manipulative use of information reflects the challenges of today; just as the Doctor struggles to gain the confidence of the warring factions in Pyramid, I think it’s fair to say we’re caught in a similar battle for public trust in real life. When the demise of civilisation comes, Moffat and Harness posit rather damningly in Pyramid, that it won’t arise out of force; humanity will endorse its own subjugation erroneously. It will be our decision, our vote… a series of mistakes that we’ve made all on our own. Like the rest of Series 10, The Pyramid at the End of the World exceeds its own simple premise artistically and socially. Whereas past Doctor Who episodes have often felt as though their authors hadn’t expanded their stories beyond the initial pitches given to them – “dinosaurs in space,” “robot gunslinger,” “ghosts in a haunted house,” – Harness’ Pyramid is an elevated production. It’s clever, topical, and complete. The appearance of the pyramid itself is merely a hook for viewers. The real story of the episode is far more nuanced: the evolution of little events into big conclusions and the false benevolence of imperialism. 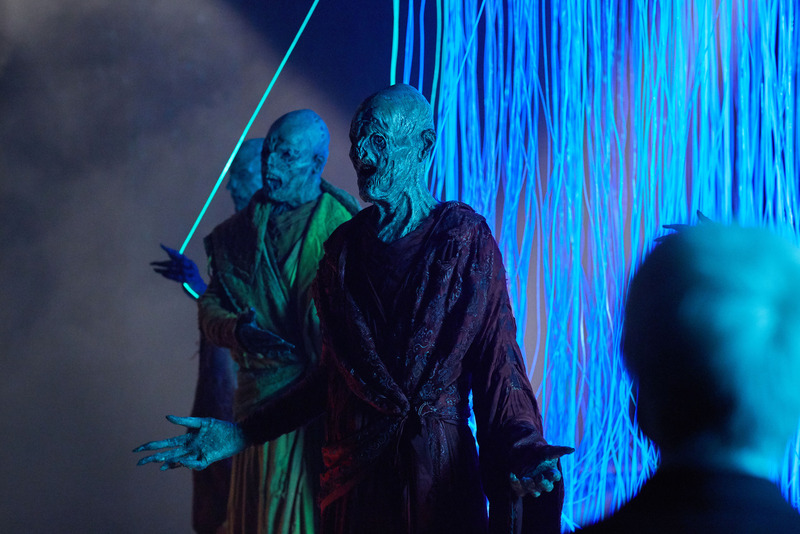 Together, The Pyramid at the End of the World and last week’s Extremis have raised some big hopes and expectations for the Monk trilogy’s conclusion this coming Saturday with returning Doctor Who veteran Toby Whithouse’s The Lie of the Land. ← You Can Stream Over 100 Big Finish Stories for Free on Spotify!